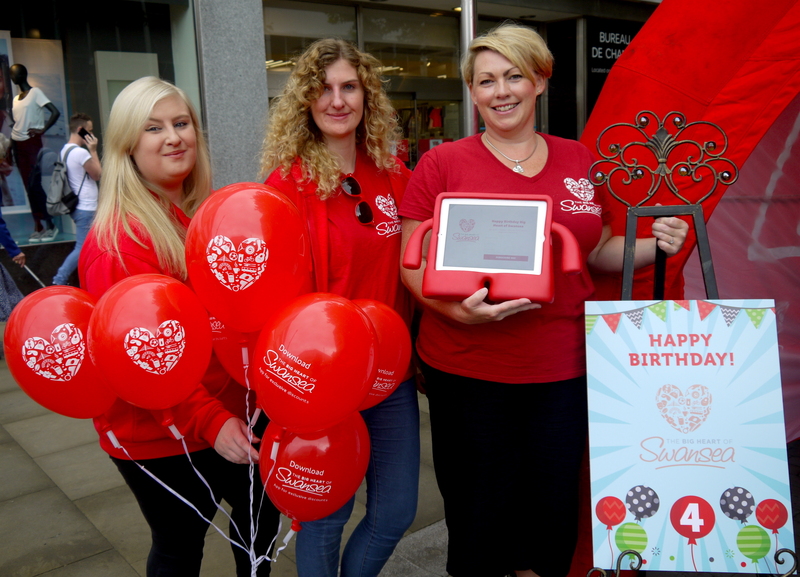 We are delighted to celebrate the anniversary of our The Big Heart of Swansea brand, marking four years of fantastic offers, bargains, prizes and promotions, all bringing shoppers and visitors into our vibrant City Centre. The success of the Big Heart of Swansea brand, with its red loyalty card no dedicated shopper leaves home without, and its accompanying app, has been one of Swansea BID’s proudest achievements, bringing real savings to shoppers and great promotional value to our BID Businesses. We will mark this red letter day in the Big Heart of Swansea marquee in Oxford Street on Tuesday 22 August and run a competition throughout August to win a fantastic holiday for four people, courtesy of Leisuretime. You can enter the competition by either downloading the Big Heart of Swansea App or visiting our social media pages and wishing the Big Heart a Happy Birthday. Swansea BID Chief Executive, Russell Greenslade, said: “The Big Heart of Swansea brand has become such an embedded part of the City Centre shopping experience that it has become synonymous with Swansea. This is something we are immensely proud of. “I would like to say thank you to all the Swansea BID businesses – from retailers to bars, restaurants and clubs and professional services providers – who have all bought into the Big Heart of Swansea brand so enthusiastically. Their continued support helps us to ensure our unique Big Heart of Swansea offers to keep coming and the brand stays fresh and enticing for consumers.